Today I have another card for Freshly Made Sketches #214 - A Sketch by Jen T and in case you didn't see the sketch yesterday, this is it. I stayed a little truer to the sketch today, but altered the placement of the elements a touch to suit the plan I had in mind for the card. 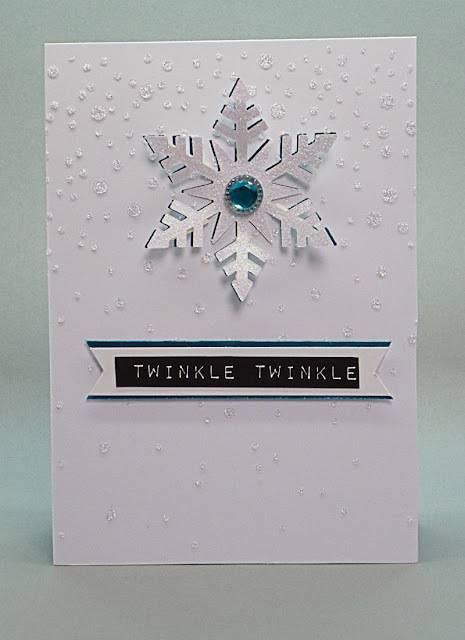 First, I used a Martha Stewart punch to punch out the snowflake, then I spread, Sparkle Medium over my trusty SSS Falling Snow stencil (I'm getting a lot of use out of those two items this year), then I left it to dry. 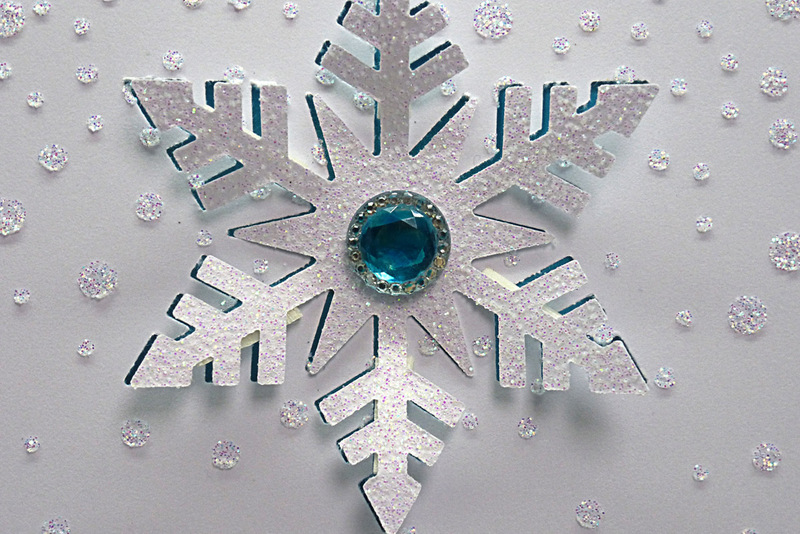 Whilst it was drying, I punched the snowflake out again, but this time out of SU Glimmer paper. When it was dry, I adhered a piece of blue foil card behind the aperture and adhered the front panel to a card base. 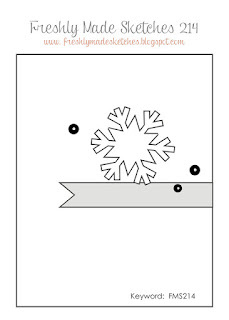 Next, I stuck the glitter snowflake back in the void and popped the 'outer bits?' (I know that doesn't sound right, but I don't know what you would call them) up with tiny slivers of foam tape for a little dimension and to allow the foil card to peep out. Finally I finished off with a layered sentiment banner to match the rest of the card. Here it is. Well, my lovelies, I think that will be me for the weekend now, as I am very behind with my Christmas cards and still need to make a ton . . . where has this year gone, I'd like to know? Hello Hazel. LOVING the blue peeping through from behind that snowflake. lovely card Hazel and the sentiment is perfect! I have replied via email Betty, but for anyone else reading this, it is, 'Diamond' . . . and that's how it sparkles . . . like diamonds! beautiful blue brad in the middle. Just perfect. 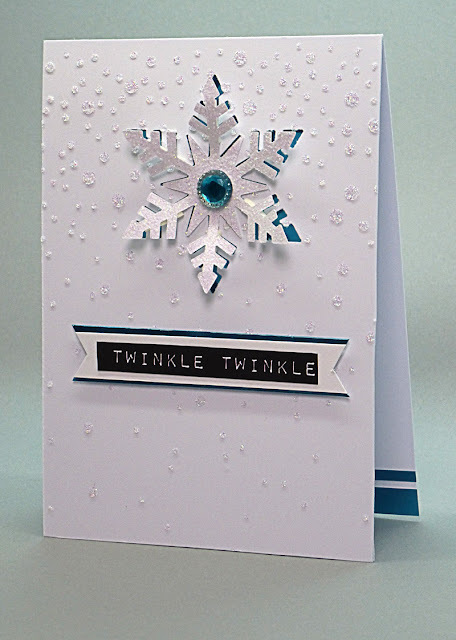 Hazel, you are the queen of clean~ I love your snowflake card and the snowdust background. The way you did the sentiment is so nice, and it makes it stark and it pops! 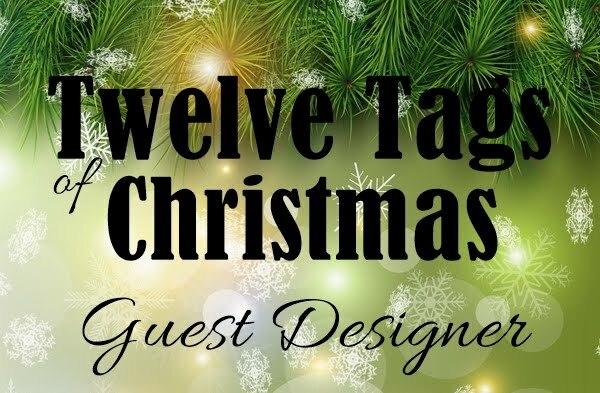 Oh, I have more snowflakes for you if you need examples but they are much colder!! Such a pretty card! 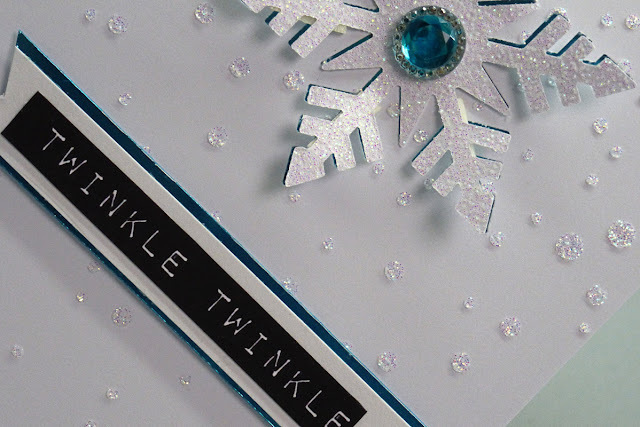 Love all the sparkle and the blue foil behind. What a beautiful card! I love that snowflake and the beautiful sparkle in the background! Thanks for joining us this week at Freshly Made Sketches! Beautiful! The sparkle is fabulous and I love the blue peeking through! Thanks for joining us at FMS! Your card is beautiful CAS. Image with zoom show how beautiful are the details. So little and doing so much. Wonderful card. I have a nice Sunday afternoon. This is a nice CAS sketch that allows the beauty of the other elements to shine. The white snowflake & embossing would have been so pretty in itself, but adding in the cool touch of the blue shimmer, really outstanding. A pretty MS punch too. Do I have that one? Must check!!! Hugs & TFS. (oh yes, I do like the way you did the sentiment too. 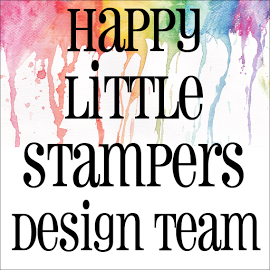 Is that a tape or stamping on black? Very effective with the white). Love the look of this. 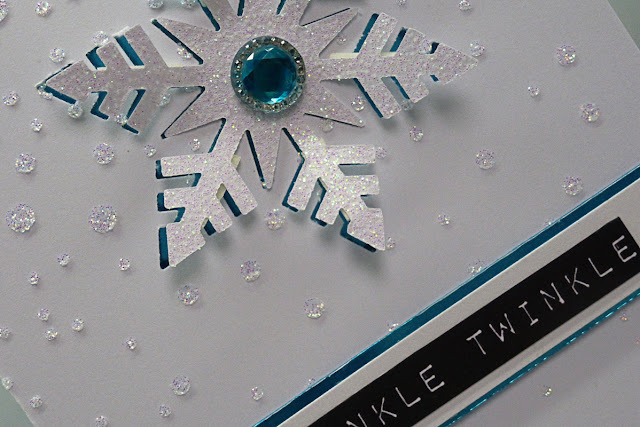 That blue foil that is peeking out from underneath your snowflake--just a brilliant look. 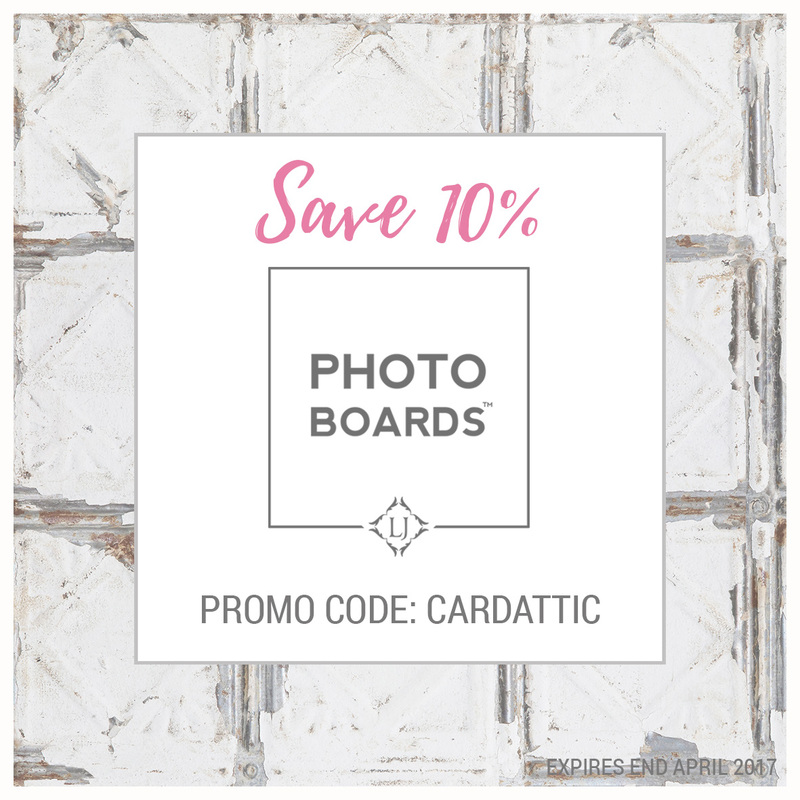 This is wonderfully full of sparkle and I love it! 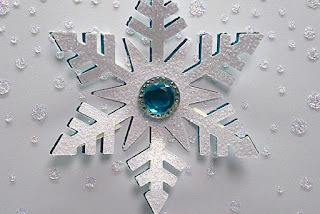 The hint of blue behind the snowflake is a great look. And there's that sparkle medium again! I think I'm going to love that as much as I love my Wink of Stella! 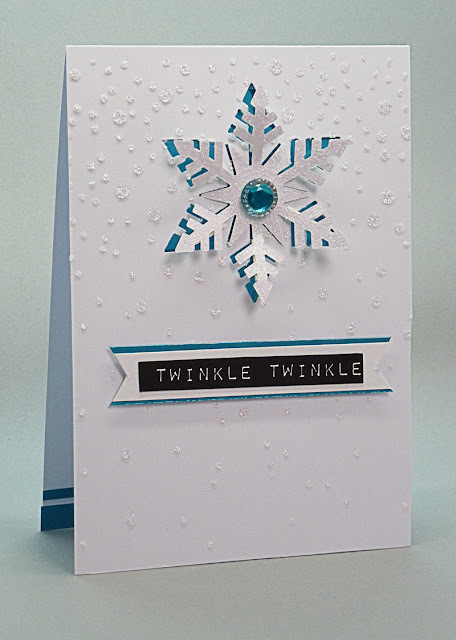 Gorgeous card...love your sweet snowflake!